You’re a farmer in a wooden shack with your spouse and little else. Agricola, the classic ‘Euro’ game of medieval farming that even knocked Puerto Rico off its long-held Number One perch at BoardgameGeek, for a time. Running a farm in the 17th century: not the most exciting subject for a boardgame, one would think. But this clever Euro-style game is a firm favourite among gamers who like wooden pieces, very little luck, and a complete lack of fancy plastic (though you can buy animal-shaped meeples separately). It’s a game of countless strategies, and also plays as a simpler family version or solo. 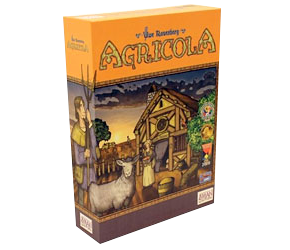 Agricola has won many gaming awards, including the Deutschen Spiele Preises Game of the Year (2008), and continues to be expanded. If you love games like Puerto Rico and Caylus, you probably already play Agricola. the rules summaries are great but I had a request. Could you possibly make “printer friendly” versions of your pdfs? I was thinking a blank background and maybe box outlines to separate sections. I hesitate to print the summaries because the backgrounds (while pretty) use up a lot of ink/toner. I appreciate your desire to save toner but – stop and think for a second. I have about 215 rules summaries on this website. Can you imagine how much time it would take to make ‘printer friendly’ versions of them, not to mention keeping both colour and B&W versions, now and in the future, up to date? Also, the whole idea of these summaries is to make summaries that are not only useful, but graphically attractive and fit with the look and feel of the game. I would suggest, if saving a dollar or two on ink bothers you, that you copy the text into a plain new document and print that. I’m afraid I’ll never be making black and white versions of my summaries. Sorry about that! Oh I see, I thought maybe the text of the PDF files were somehow isolated from the graphic parts of the PDF work files and that maybe by running some kind of script that “text-only” files could be generated. But to be honest, I don’t really know much about the inner workings of PDF files and creating them with graphics and backgrounds. Well, thanks for the response and keep up the good work with the summaries, they really come in handy! I think we all appreciate and love your work here very much, but I think Shawn was just making a suggestion without knowledge of how much time it takes to convert, I didn’t know too. I just made your very nice laminated (I must say very impressive) summary card out for my customised Death Angel box, but for some people out there, that may be too much.